most complex and troublesome areas are those concerned with ammunition handling: the mechanisms for loading, firing, extracting, ejecting, and reloading. All such guns can be divided into four classes according to the motive power used to achieve this: externally powered, blowback-operat-ed, recoil-operated and gas-operated. Each of these major categories has sub-groups, for example recoil-operated weapons may have short- or long-recoil mechanisms, and in some cases elements of two or more classes may be combined in one gun. Machine guns may also be described by the design of the mechanism for chambering and firing ammunition. This may be linear (i.e. the bolt is thrust back in a straight line, collecting a new round on the return stroke), revolver (in which there is a cylinder containing several chambers rotating around the rear of the barrel, into which cartridges are inserted and removed in stages) or rotary (similar to the revolver except that there is a barrel attached to the front of each chamber and the whole contraption rotates). One variation applying in the case of rotary cannon is the number of barrels used, usually between three and seven. Similarly, the number of chambers in a revolver cannon may vary, but there are usually four or five. Another variation, this time to the linear system, is a tilting or sideways-sliding breechblock instead of a rearwards-moving bolt, in which case another element of the mechanism is required to load a fresh cartridge. A third form of description is the method of holding the ammunition ready to be loaded into the gun. 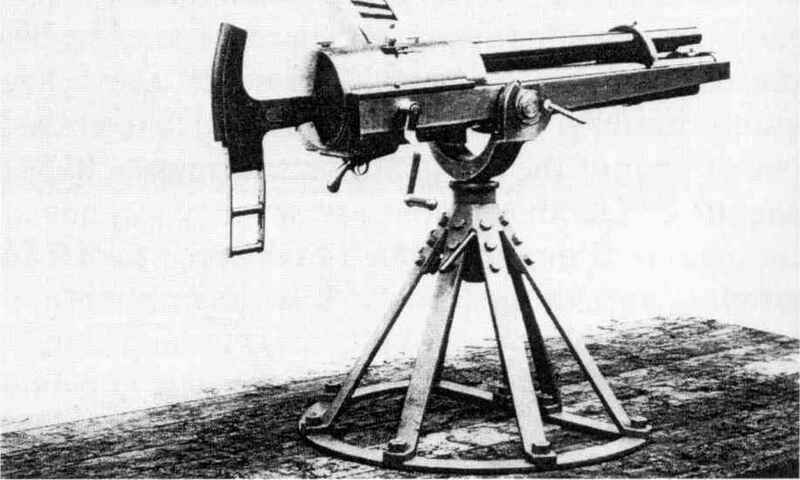 This may be contained in a belt (pulled into position for reloading by another mechanism driven by the gun, or more rarely separately powered), in a box magazine (with a spring used to ensure that the cartridges are held in position) or in a drum or pan magazine (which may be gun-powered, spring-driven or use some other form of external power). Other methods include gravity feeding (using guides or hoppers, now generally restricted to large AA weapons), in which several rounds are sometimes held together by clips for ease of handling, and (in smaller calibres) rigid strips of ammunition which may be clipped together. Still further descriptors concern the method of ensuring that barrels are not damaged through overheating. They may be water- or air-cooled, and in the latter case may have fixed or interchangeable barrels. The above list of possibilities is not comprehensive but does give the major categories, which will be expanded on below.